The Sunny Health and Fitness Rowing Machine is a valuable addition to any home gym or office setting. Compact, portable, basic, and affordable, this rower is great for anyone new to the rowing workout regime, or to exercising in general. The Sunny Health rower offers amazingly simple assembly. It’s not unrealistic to have the rower out of the box and assembled in less than 15 minutes. Unfortunately for those outside of the U.S., this machine company only ships in the United States. This particular rower has 12 adjustable levels of hydraulic resistance, giving the user the ability to completely control their workout and intensify or relax their workout as they see fit. The rower has pivoting foot plates and adjustable foot straps to allow the user’s feet to move naturally as they row and ensure that they do not slip, no matter how intense the workout. This lightweight rower features an easy-to-read electric display monitor to help you keep track of your time, the calories you have burned, and your row count. However, the calorie count does not go by the user’s weight and therefore may not be entirely accurate. Also, the display does not monitor the user’s heart rate as many of the more expensive rowing machines do. 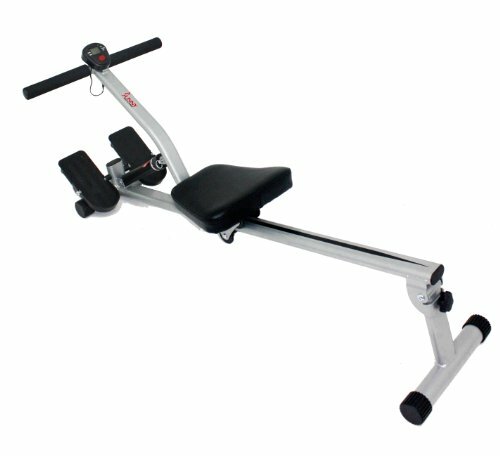 Weighing in at only 24 pounds and featuring foldable arms, the Sunny Health and Fitness Rowing Machine is easily moved and stored, making it great for anyone with limited space, especially when you take into consideration that its assembled dimensions are only 53.2 inches long by 20 inches wide by 21.5 inches high. This means that almost anyone can maneuver the machine, which makes it a great exercise tool for the elderly. The handles feature grips to make your workout more comfortable, a heavily padded seat that conforms to the user, making extended use comfortable. This machine’s simple build and construction can accommodate a weight of up to 220 pounds, and is comfortable for people of average height. This somewhat limits the consumer market for this item, and there have been reports that taller individuals have a hard time using the machine to their benefit as they cannot fully extend their legs. The machine is made from both steel and plastic, which doesn’t exactly promise that your machine will withstand the test of time or multiple intense workouts. Add in the fact that the warranties on both the frame (1 year) and the parts (90 days) are pretty limited, and you have a rower that is best suited to someone looking to purchase their first machine, or looking to use it sparingly. Granted, the machine is simple and affordable, but the more seasoned athlete may need to purchase a more durable rower. This means that almost anyone can maneuver the machine, which makes it a great exercise tool for the elderly. The handles feature grips to make your workout more comfortable, a heavily padded seat that conforms to the user, making extended use comfortable. This machine’s simple build and construction can accommodate a weight of up to 220 pounds, and is comfortable for people of average height. This somewhat limits the consumer market for this item, and there have been reports that taller individuals have a hard time using the machine to their benefit as they cannot fully extend their legs. The machine is made from both steel and plastic, which doesn’t exactly promise that your machine will withstand the test of time or multiple intense workouts. Add in the fact that the warranties on both the frame (1 year) and the parts (90 days) are pretty limited, and you have a rower that is best suited to someone looking to purchase their first machine, or looking to use it sparingly. Granted, the machine is simple and affordable, but the more seasoned athlete may need to purchase a more durable rower.